Lilly Pulitzer Sophie Dress + 4 Books I've Read Lately. 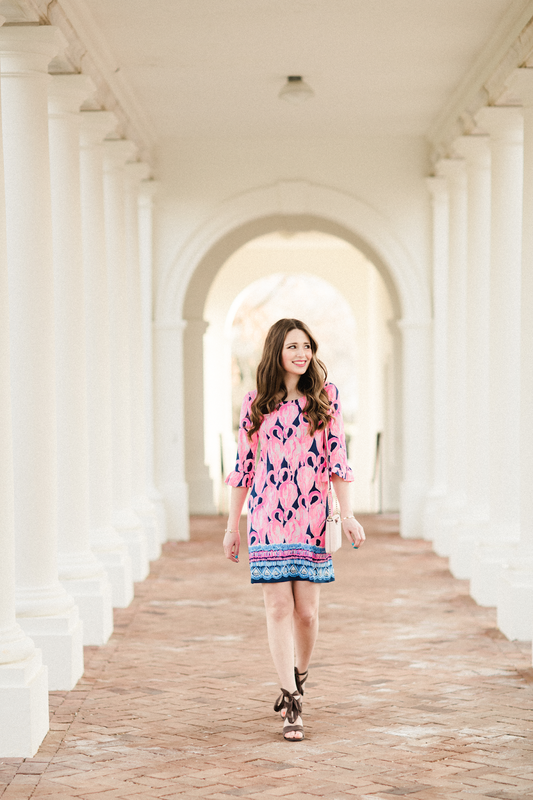 So excited to be "back at it" with new fashion content today - here's my first outfit post from Virginia!! I'm also sharing an updated round of book reviews with the books that I read at the end of winter. I haven't read anything in the last month since I haven't gotten a Virginia library card yet.... hoping to change that soon! 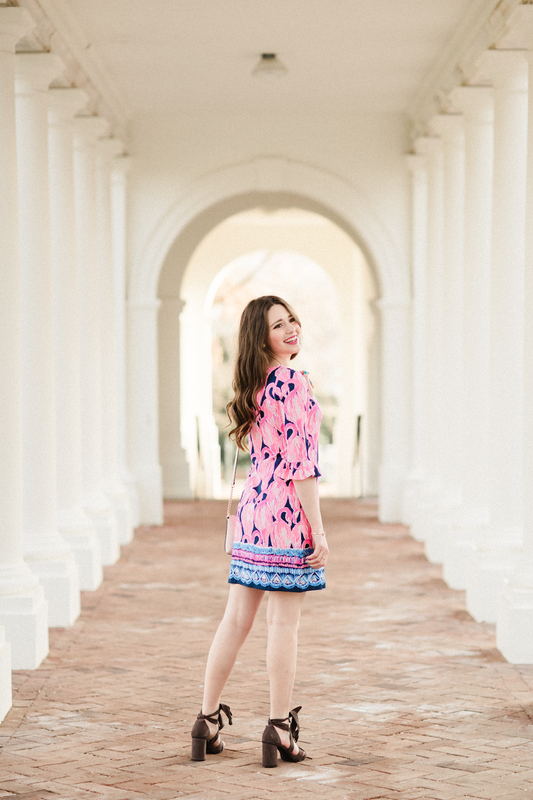 What better way to kick off new fashion content from Charlottesville than with a spring Lilly Pulitzer outfit? Virginia is the perfect place to wear Lilly, and I am so excited to break out all of mine once the weather is a little warmer. This darling Sophie Ruffle dress is from Pink Colony, the charming Lilly speciality boutique in Stowe, VT that I got to visit and work with for SBIT this winter! (Check out my most recent collaboration post with Pink Colony here!) 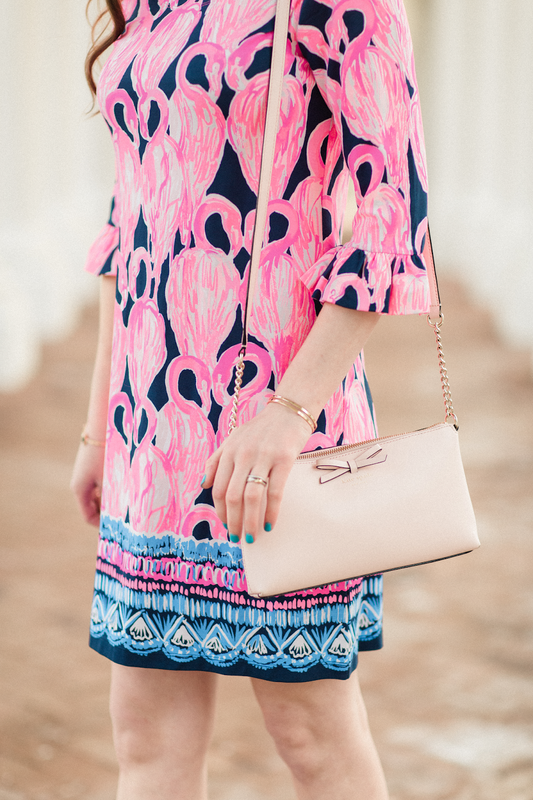 I cannot get over how pretty the navy and hot pink colors are for the flamingo print on this dress. I love it! I know I'll be wearing it on repeat all spring and summer. Pink and navy really is the cutest color combo that I don't wear enough of. It's been so long since I've shared any book reviews on the blog, and that's made me sad!! One of my new years resolutions was to read 30 books in 2018. I got off to a strong start with three books in January... then one book in February... then no books since! 😭 Job applications and moving out-of-state, while working full time and running a blog is no joke!! My new apartment does have a pool that will be opening once the weather gets a little warmer, so once I get a local Virginia library card, I'm hoping to make reading by the pool a weekly, if not daily occurrence!! There's still time to hit my resolution goal right? Anyways- here are the four books I've read so far this year. Differing from my past reviews- 3/4 of these are non-fiction! *The Best Travel Hacking Guide by J.F. Warden: Another topic that I want to educate myself more on this year and next is the concept of travel hacking. It is incredible to me that people are traveling pretty much for free, simply by how they are able to utilize their credit cards, airline miles and rewards points! This was another book on my Christmas list, and I loved it!! It's a very small but extremely informative guide to travel hacking. The author is very well-versed in the ins and outs of the major airline carriers and rewards credit card companies and provides so much handy information. His travel style would be a bit different from mine (He writes that he's a fan of the "couch surfing" method of lodging... since I've had bedbugs in the past, you literally couldn't pay me to do that haha! ), but there was still so much useful information that I got from this book. I probably won't be starting my travel hacking journey in 2018 since I just started my new job and don't start getting PTO for awhile, but hopefully in 2019 I'll reread this book and finally start this new hobby! *Leave Your Mark: Land Your Dream Job. Kill It in Your Career. Rock Social Media. by Aliza Licht: Oh my gosh- I had such high expectations for this one. I put this book on my Christmas list because the title really grabbed me! In early December I was starting to prepare my resume and portfolio for job applications, so I thought this book would give me some motivation as I started looking for new radio jobs after Christmas. Similar to the first book I reviewed above, I think I might have a totally different view on this one if I'd read it in college (or even high school?). Aliza tells the detailed story of how she unexpectedly ended up working in Fashion PR in New York City (her original plan was to get into the medical field), and while her story is interesting, I found the book to mostly be about her personal story, and not as much about offering advice for others in their careers. The advice that was given in the book was really just geared to college students who want to work specifically in PR or fashion related industries, so I didn't find many takeaways that helped with my own job search this winter. But- there were still parts of Aliza's story that I enjoyed reading! *Love the One You're With by Emily Giffin: My former blog photographer and sweet friend Deeana gave me this book for Christmas, and I loved it! It tells the story of Ellen, a New York City photographer, and her marriage to her husband Andy. Their marriage seems perfect... until Ellen runs into an ex-boyfriend, and she starts having confused feelings for her past. This book hooked me in from the start, and it was a lovely and fun read! One quote from the character of Ellen resonated with me so much that I actually used it in my blog post where I announced my move to Virginia. 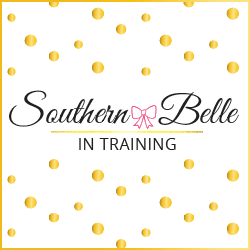 Thanks so much for reading today's post! I hope your week is off to a great start. My outfit details and the books are all linked below! One, I love this dress on you. Two, what a fun photo shoot location! Three, can't wait to add these to my reading list! Cutest outfit shoot! You already look so happy in your new state! And Love The Ine Your With is my favorite Emily Griffin book! It’s so good! This dress is super cute on you, and I definitely should add some of these books to my own list! I'm not usually a huge Lily Pulitzer fan because I think the prints are just too much sometimes (I like things simpler) but I really like this one. The flamingos really pop. omg definitely gotta give these books a read because it sounds like we have similar interests haha and i love that dress on you! you rock lily pulitzer patterns so well! This is such a pretty dress and love the print of it. Love emily giffin! Thanks for the honest opinion on licht's book! I had a feeling I'd feel the same way you did so I've been avoiding it! I love this dress! It's so cute! And what great reads! I'm definitely interested in the one by Aliza Licht. I need to add it to my list. Those books sounds amazing! So good you clarify the one "Leave your mark" because I thought a different things just by the title! Beautiful photos! That dress looks gorgeous on you! Emily Giffin is one of my absolute favorites. her novels instantly reel me in and before I know it - it's 3am and I can't stop!